The first I think you are vietnamese, right? ^^.I’ve research Kendo UI and angularjs with ui-routeer.And I got he problem with Tabstrip,I spent 3 days but still not found the solution how to used Tabstrip Angular of Kendo UI and ui-router.Do you have any advices? You should be using the AngularJS $routeProvider, meaning your application should really be using AngularJS for things (architecture) other than your widgets, which should Kendo UI. Yep. I realize that. I think I am going to go with Query objects or the like, as proposed by the great Ayende Rahien and Jimmy Bogard. The need for abstraction is absolute. I just think the repository pattern is on the way out. I’d rather be on the cutting edge. Cheers. One of the framework’s design and architectural intent is to minimize the surface area of your ORM e.g. EF, in the case you need switch this out or refactor, this would be minimized to the Repository layer. Whether or not this is an architectural design principle that would be of value to one’s project or not, that would be something you would have to answer to. In most cases these patterns have been extremely beneficial in long term projects. Thanks for great post. Any succeed in getting the this generic UOW and Repo pattern working asynchronously and with await and Task in .NET 4.5 ? and It works perfectly fine. Though still trying to get it async. I really appreciate any update or starting point to work on. 50% related question , I would like to hear your opinion : I wanna add to your solution a Settings class that every x seconds will update ‘global system data’ from the database , like “DefaultDateTImeFormat” or “MaxUsers” or “SecondServerUrl” for example , how you suggest to do this? Your probably better off using the new .NET System.Runtime.Caching libs and setup a SqlChangeMonitor (dependency) with this. That way your cache/class is only refreshed when it needs be, in this case when there is an actual change in the Settings SQL table. Nice post, however I’m not a fan of the tight coupling between Unity and your controllers (which you create either by injecting a Unity container or adding the [Dependency] attributes to your controller constructors). Once again great post, can’t wait to check out the asynchronous one. Should UnitOfWork be a singleton? Else why should I even bother saving repositories? (The use case of a thread using the same repo twice is not so common in a web application). The motivation to the question comes from trying to add some notification capabilities to the repositories. Such as letting some listeners know when a certain entity was updated. Without making the UnitOfWork singleton, you must introduce a Bus or some other way to persist these events. The IUnitOfWork instance lifecycle is bound to the lifecycle of the HttpRequest, this is configured in the UnityConfig under AppStart. So it is Singleton for a given user for their HttpRequest. Probably not, concepts should stay fairly the same if not exact despite what DI & IoC framework you use. Just use Ninjects named bindings as depicted in the post vs. Unity’s. How about Unit Testing with Microsoft Fakes? I tried, but ran into complications. Most samples assumes an IRepository instead of IUnitofWork. Have you thought about creating an Async Repository or adding Async methods to your repository? I am using your Repository and UoW with EF6 RC1 to implement the 3 OData base classes: ODataController, EntitySetController and AsyncEntitySetController. I started the Async implementation. Need more research and testing, but I’d be happy to help you out. Funny, the AsyncEntitySetController was the same reason why I started on add Async implementations to the UoW and Repo Framework. Question, I noticed when implementing the AsyncEntitySetController, that it want’s you to return a collection vs. an IQueryable, if that’s the case will query translation (OData automatically passing and handling all the query criteria to EF) still work? // Verify that a genre with this Id exists. //_context.Products.Attach(update); // Replace the existing entity in the DbSet. Hey Ivan, could you provide me with an email address? Looks promising, will let you know when I’ve uploaded to GitHub. On the NorthWindContext class, you have declared a static ctor, which sets the DB initializer to null. 1. I obviously can’t inject the IUnitOfWork to the NorthwindContext, even if I ignore the static constructor, since it result a circular dependency. 2. Nor I can inject it to the UnitOfWork from the same reasons. What I can do, is manually creating a UnitOfWork instance inside the Seed method giving a DBContext object is provided to this method. However it is pretty ugly. Any ideas how to overcome this coupling issue on your model? Great post series! Love it!. I’ve been playing with some portion of the code around, trying to figure out how would I go and get related entities by using OData queries (syntax) -> basically make the Repository translate the $expand into .Include (the repository syntax). To the controller (prevents me from generalizing some basic controllers). While this might be the desired behavior, I would really like Repository to “understand” the OData syntax – that is – ‘?$expand=Address’, will give me the same result. Sure, you can need to enable lazy loading which I’ve disabled. You can find this in the UnitOfWork.cs, believe it’s in the Constructor. Do you have a repository that works with the objects generated by the EF6 Designer? E.g. db.edmx has db.Context.tt and db.tt, db.tt will generate the POCO classes in the edmx model. I’d love to see the UoW and Repository for that. Thx for your great contribution. This already works with EF6 designer generated DbContext and POCO entities. Just need to set the UnitOfWork here to the DbContext that was generated by the designer and your good to go. Say I have multiple DbContexts, split by schema or even across databases. If my controller or service layer needs to do an atomic operation across those contexts (UoWs), how would I go about doing it? Typically you might instantiate a TransactionScope in the controller or service layer and inside of it create the UoWs/DbContexts and make the changes. Now, since my UoWs/DbContexts are instantiated and injected by the container, where might the TransactionScope “live” and be created? Hi Jim, I would imagine you would do this the same way we traditionally have done this which is make sure MTC is installed on all box’s that are participating in the transaction with the web server (e.g. if it’s a web app) along with the SQL servers, and instantiate the Transaction scope via using block and go from there. Could you let me know, if you are successful in this? Btw, last I’ve touched upon this in EF5, we didn’t need to instantiate the DbContext within the using block of the TransactionScope, again, please verify this and let me know if this works. I’m in the middle of building my context(s) out, so this is a very well timed post. I will have a single-tenant database/multi-tenant application architecture (with each tenant having a different URL and possibly customization in the UI). One Tenant Management DB and one DB for each Tenant. I was planning on having a bounded context for each DB (as I don’t know of a way for one context to share DB — if you know how to do this — that would be amazing!) — so at some point there could be two active bounded contexts, one pointing to the Tenant Management DB and the other pointing to the Tenant customer DB. There may be time in which I will need to do cross-talk between the two, for example If I’m pulling up a list of Tenants (as a SaaS employee), and I want to see the number of customers a Tenant has (something along these lines). It would be great to see an example of communication between two different context.uow.repo.entity in a new business logic class library project, just before the web api. Thanks for the answer. I really appreciate the time you are spending. what if I have an MVC controller which may need to leverage 2 different unit of work above that you have e.g. For example a scenario in which both NorthwindCustomerContext and NorthwindContext are needed. Do I have to create another DbContext containing the mapping I need? and just work with that. Could I instantiate both at the same time and work with them in the controller and wrap any concurrency with TransactionScope? The ladder (second) option, just use two UoW within the same controller. The UI or MVC web app, should not have any code at all with dependencies with EF e.g. DbContext and same goes for your Entity project which has all of your POCO’s. It should only know of the UnitOfWork. You shouldn’t even need a reference to EF for that matter, it should only be copied to your bin directory for your connection string providerName e.g. providerName=”System.Data.SqlClient”. You do this by simply referencing the Repository project in your MVC app, and only interacting with the UnitOfWork with interacting with the database. How will I remove the dependency of my MVC app in EntityFramework if I registered the IDbContext to the NorthWindContext? I am really sorry if I keep on asking. I really like to learn this good stuffs. The type String cannot be constructed. You must configure the container to supply this value. [ResolutionFailedException: Resolution of the dependency failed, type = “BISWebApi.Areas.HelpPage.Controllers.HelpController”, name = “(none)”. Exception is: InvalidOperationException – The type String cannot be constructed. You must configure the container to supply this value. 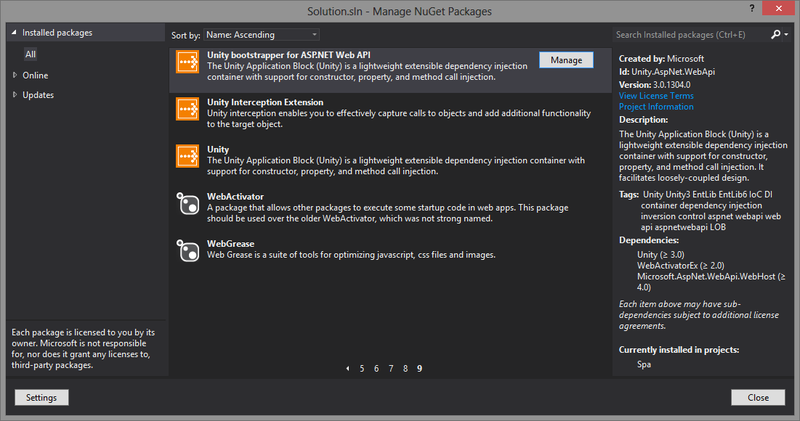 Nuget version wise I am using the following libraries. Curious if you have run into this yourself or if any of the readers have seen something similar. I haven’t found a Unity configuration around this exception yet. Yikes the comment posts added the Nuget versions as HTML. What I get I suppose for cutting and paste from packages.config. Hi Ken, thx for the postive feedback, could you paste in all the constructors for the HelpController? It appears that the problem is that Unity is unable to resolve the HelpController with a constructor with parameters. You are correct. The code is from the HelpPage nugget package and the issue is indeed how to select the correct controller. It’s just the boilerplate code from the MVC4 template via PU2. Quick question, the exception says a problem with injecting constructor parameter config which I see is the HelpController(HttpConfiguration config) constructor, however I see that the paramaterless constructor HelpController is the one marked with the [InjectionConstructor] attribute, which constructor do you need to be invoked by Unity (container)? In this case the parameterless one. Only because it appears this constructor is used in normal operation verified by watching execution outside of this project to see what was involved for simply navigating to http:///help (right click new project, F5, navigate to help to see what is normally used). Again this is boilerplate code written by the ASP.NET team using ApiExplorer to generate docs for the Web API code which is why I don’t wish to modify it. To be clear I added the [InjectionConstructor] attribute to get around the exception. I am hoping I can remove it and instead find a better way to specify the appropriate constructor in the UnityMvcActivator for example. Please remove any attributes that were added to the HelpController, make sure there are no changes to it, and it is as it was from the VS Template. Either of these should work, preferably go with Option 2, which is the default behavior to begin with. Ken, please let me know if that worked for you. Yes it worked (either option, went with 2). Thanks! I’m currently working through this code/post and I’m also using Simon Huge’s Reverse POCO template. There is a fork of this template that allows for the exclusion of generated types. 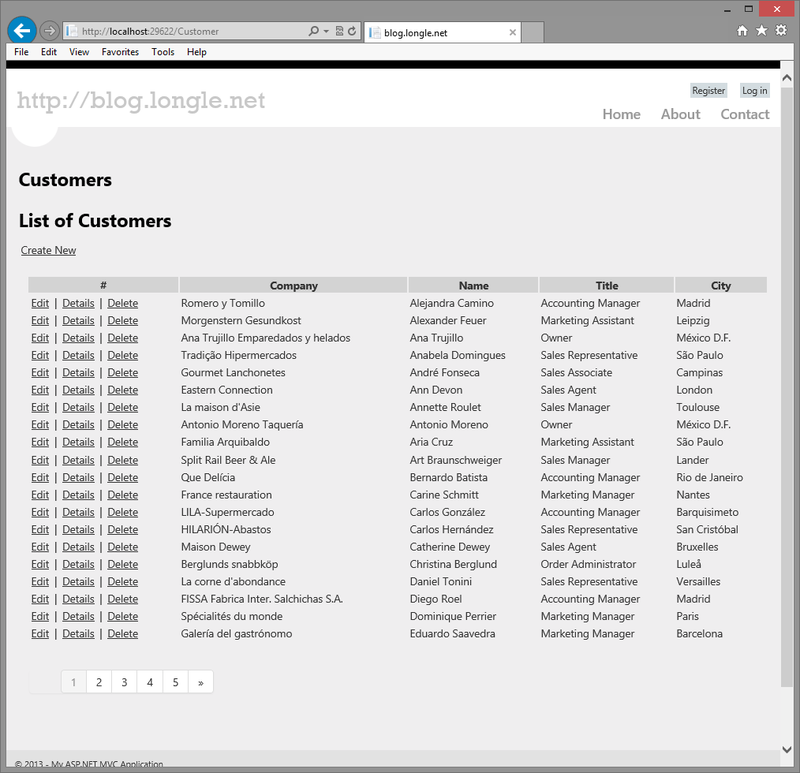 For example you can exclude mappings or entities. I’m using this fork to generate my mappings in the data layer and entities in my model layer. Also, looking a Le’s code, he made a change to the entities and mappings by applying State. It’s difficult to extend via partial classes the configuration of the auto-generated mappings (configuration) when everything is init in the constructor — and of course there is no partial constructors. Before the mappings classes, while partial were also internal — with no option to change this. So in addition to using the fork I mentioned, I changed the T4 to allow for public partial configuration classes and the addition of a OnInit() in the constructor so I could add the addition of Ignore State in the configuration — otherwise we are really locked down on what we can do with the configuration files. Anyhow, if you’re interested I can post the changes I’ve made that allow me to take advantage of Le’s setup and use Simon Huge’s T4 code. Aaron, thank you for your thoughtful comments. I would be interested in seeing your extensions to Simon’s work which it appears Le maybe be incorporating into this posting. Your idea on moving the State property to a separate partial class is also a great idea. Yes, could you please reply and post the your version of the T4 templates of Simon Huge’s T4 implantation with the UoW and Repo setup we have here. Would like to take a look, and I’m sure some of the readers here might be able to leverage this, especially when dealing with large databases to generate there POCO entities. Question, does this also generate the EF entity mappings as well? I just emailed you the T4 template. Just add them to your project and when you save the .tt file, it will attempt to read you connection string so forth. Yes, it has the ability to generate POCOs (Entities), Context/IContext, Configuration (Mappings). Also, you have the option to make the classes partial. With the version you have, you can selectively choose which out of these you want to generate. For example, I don’t want the POCOs generated in my Data project, but I do want them generated in my Model project. Also, in the version you have, you can make the Configuration (Mappings) classes internal or public and choose if you want to add an OnInit() to the constructor. I have the Entities generated in the Model dll, and this project includes the State property which the Entities add through partial classes. Also they inherit from — i think it’s called IObjectState. I don’t want the State property to propigate to the DB, so I need to use Fluent API to Ignore the State property. The default for the template was to make the Configuration (Mapping) classes Internal. That cause me to have to add the Entities to the same project or they could not see the new State property of the Entities. I changed this to public, and now you can separte the Configuration from the Entities. Also, since the Configuration (Mappings) are set in the constructor (for example Ignore(x => x.State), and there is no partial constructors, even though the Configuration classes generated where partial, I could not extend them properly. So I added an option to place a public partial OnInit() method to the constructor of the generated Configuration (Mappings) classes. This way in the non-generated public partial class Customer, I could add the implementation of OnInit(), which in my case (and per your example) was this.Ignore(x => x). This way when the Context was build and passed in the Configuration constructor, the State would get ignored. Thanks Aron, once I’ve looked at these, are you OK with me uploading them and making them available to any other readers that may find these handy? No problem Le, Just let me know if I can help somehow.